Born in Nagoya, Japan, Shoko Nagai has been evolving as a professional musician for more than 18 years. 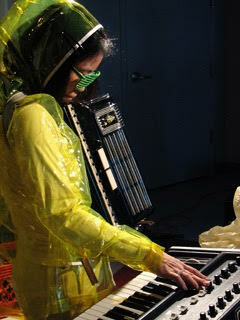 After graduating from Berklee College of Music in 1999 she moved to New York City and quickly established herself in the downtown jazz scene performing with such renowned artists as John Zorn, Erik Friedlander, Ikue Mori, Marc Ribot, Frank London, Matana Roberts, Miho Hatori (Cibo Matto), Satoshi Takeishi, Butch Morris, Elliot Sharp, Ned Rothenburg to name a few. Nagai has performed in Sweden ( The Nobel Prize ceremony 2009 for a German writer, Herta Muller), Italy ( Napoli Teatro Festival 2015), United States ( Newport Jazz Festival 2015, Saratoga Jazz Festival 2008), Austria (Saalffelden Jazz Festival 2014), France ( Banlieues Bleues, 2012), Switzerland ( Rote Fabrik 2012), Holland ( Bimhuis 2012), Japan ( Fuji Rock Festival 2012), Israel ( Romanian Institute 2011), Canada ( Suoni Popolo Festival 2008), Germany ( Moers Jazz festival 2007), and Brasil ( resfest 2007). She is a winner of grant from New York Foundation for the Arts (NYFA) 2010, and JazzJants (Painted Bride Arts Center) 2008. She also composed music for films and performed live for screening. Her works includes, a French film L’AMOUR CACHE 2007 directed by Alessandro Capone, conducted by Butch Morris. And three documentary films directed by Linda Hoaglund The Wounded and the Gift which showed at IFC Film Festival NYC 2015. Japanese TV network NHK documentary film Things Left Behind 2014 which received many awards and ANPO selected for 2011 Toronto film festival and invited Vancouver, Hong Kong, and Poland Film Festival. Even though she was trained as a popular music musician specialized in instrument by YAMAHA called Electone” , she has developed a keen sense of more abstract way of expressing through music. Her piano training as a classical and Jazz contributed also contributed to her unique talent as multi- keyboardist.Whether she is on accordion playing Romanian, Klezmer, Balkan, or whaling on Moog Synth and plucking strings inside of a piano, she gives her 120% to express herself beyond musical genera.